Welcome to the Mainstream Services online store. We offer a variety of educational products to assist students, families and schools. 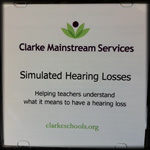 From a bi-monthly newsletter to resource guides, audio simulations, children's books and training materials, our products address the many facets of hearing loss. You can shop online or use our printable order form. Are you looking for the Clarke Note-Writer? Standard shipping is UPS Ground. Please contact us for additional shipping options and international rates. Sign Up for Mainstream News online! Clarke publishes The Mainstream News three times per school year (Fall, Winter, Spring) as a resource for educators and families. Timely, practical articles help professionals and parents provide students with effective support and access in educational settings. 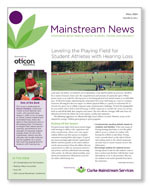 This newsletter addresses a broad range of issues related to mainstreaming, including both practical information and social/emotional adjustments to hearing loss. Starting with the Winter 2015 issue, you can read The Mainstream News online (see above)! We gratefully acknowledge Oticon Pediatrics for its sponsorship. - Encourage collaboration between families and schools teams. - Instill confidence in staff and students as they learn to use assistive listening technology together. - Provide information to support trainings on hearing aids, cochlear implants and FM systems. - Promote effective systems for monitoring and troubleshooting this technology. - Suggest ways to integrate this technology – and related communication strategies – in a way that benefits all students. "What does my student hear?" 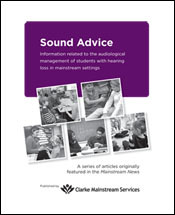 Recordings approximate the sound of various hearing losses as heard through a hearing aid, allowing a better understanding of what a student hears. Presents speech at two distances, 1 foot and 12 feet. Grades 1, 4, 8 and high school. Enabling children with hearing loss to find their own voices and speak up for themselves at home, at school, and everywhere they go in the hearing world is surely the greatest gift we can give them. A guide for parents and professionals, this booklet offers suggestions for encouraging the development of self-advocacy at home and school. Published in 2010. 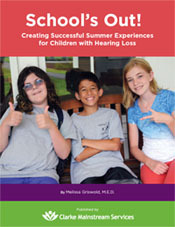 Summer Jobs and Beyond: A Guide for Teens with Hearing Loss and the Adults Who Work with Them. This guide helps teens learn how to land that first job or internship. Topics include networking, resume building, preparing for an interview and more. 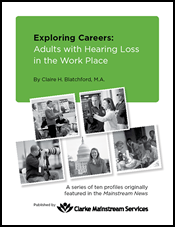 Features workbook-style pages that compliment each topic, suggestions for adults throughout, and specific information related to having a hearing loss and finding a job, Summer Jobs and Beyond is a must-have resource for programs working directly with teens with hearing loss. Molly and Max are two regular kids who happen to have a hearing loss. Listening can be hard work and misunderstandings happen sometimes, but they don't let their hearing loss stop them from making friends and having fun! An ideal teaching tool for raising awareness about hearing loss and promoting friendships in mainstream settings. Kit includes one children's book, one educator's guide and one children's activity book. Published in 2007. A workbook developed for school counselors working with children on the elementary level. 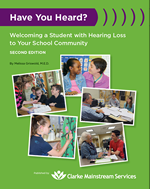 There are three sections to the book including: information about hearing loss; an initial social needs assessment and a follow-up assessment; and sample activities that can be used in small group social skill training sessions. Published in 2004. Revised in 2012. Produced for oral transliterators to use as practice material, these videos are ideal when preparing for the Registry of Interpreters for the Deaf (RID) Oral Transliteration Certification Exam. Published in 2005. Shows oral transliterators working in various settings highlighting expressive, voice over and interactive oral transliterating. Appropriate techniques demonstrated by skilled oral transliterators. (72 minutes) Published in 2005.